Burnaby is located on the east side of the city of Vancouver. While here we stayed at the Burnaby Cariboo RV Park. It is immediately adjacent to the Burnaby Lake Regional Park just off the Trans Canada Highway. We visited the city of Vancouver on our car trip back in 2014. In North Vancouver you will find the Capilano Suspension Bridge. This is a tourist attraction with the primary feature of a suspension bridge crossing the Capilano River. The bridge is 460 feet in length and 230 feet above the riverbed. 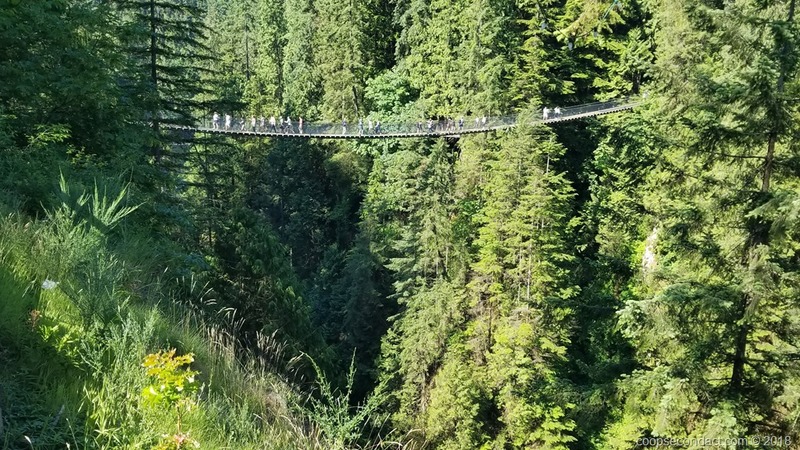 The other features are Treetops Adventure which is a boardwalk and elevated footbridges among old growth forest and Cliffwalk which is a narrow walkway cantilevered from the cliff’s edge, extending out over the open canyon. Don’t get me wrong, this is a beautiful place but it felt a little too staged for my tastes. There are many places where you can get a comparable experience without the admission price which was about $69 USD for the two of us. However for those who are unable or unwilling to do a little hiking, then this provides a convenient way to get the experience. On another day we did a day trip west to the end of the Trans Canada Highway at Horseshoe Bay. From there Highway 99 turns north on what is known as the Sea to Sky Highway. Immediately, you encounter jaw dropping beauty along the shore of the bay. And it doesn’t stop as you continue north passing through Brittany Beach, Squamish and Whistler. Along the way, a short walk gets you to Shannon Falls which at almost 1,100 feet is the third tallest waterfall in British Columbia. The Whistler-Blackcomb ski resort was home to the 2010 Winter Olympics. It is a large ski resort with extensive facilities and village development. 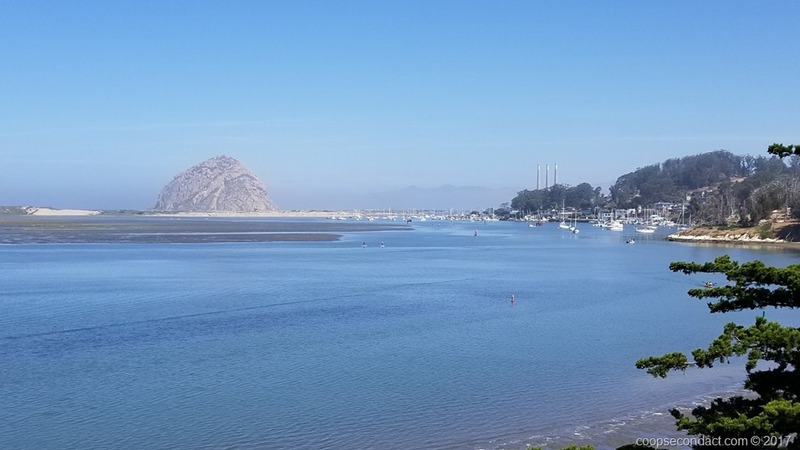 We have visited Morro Bay a few times but this has been our first stay here in the motorhome. We stayed at a very nice small RV park which is ideally located with a two block walk to the center of town and a two block walk in the other direction to reach the waterfront. In Waterloo, NY, we parked at the Waterloo Harbor Campground. This is in the heart of the Finger Lakes region of New York. When you look at a map you can easily imagine the movement of glaciers that gouged out this series of lakes in a pattern that looks like fingers extending from a hand. 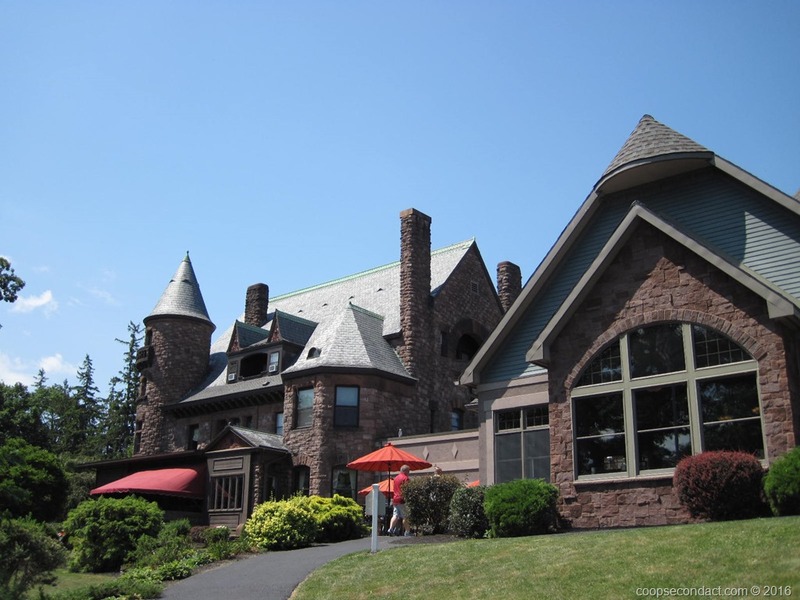 Jamestown is located on the southern end of the Chautauqua Lake in far western New York state. 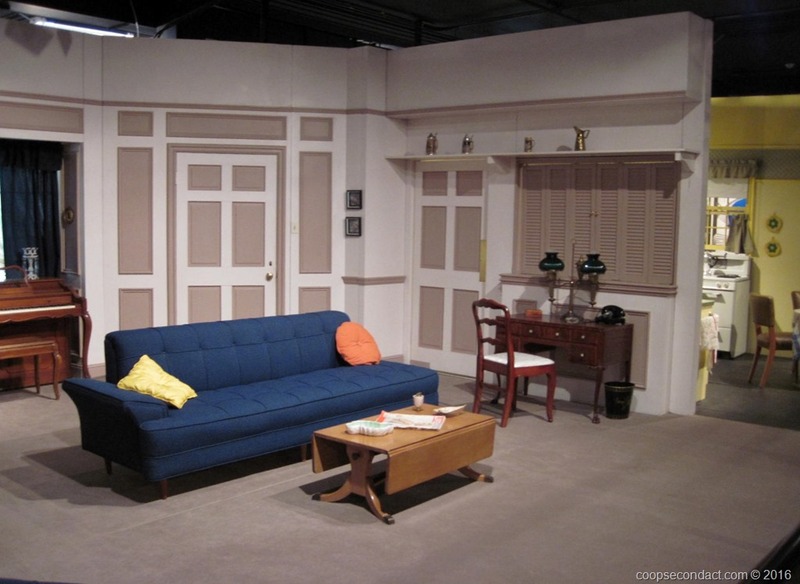 Jamestown is also the birthplace of Lucille Ball. At the age of 15, Lucy convinced her mother to allow her to go to New York City to attend an acting school where she was told that she had no talent and should find something else more suitable. Clearly, she persisted and some 6 years later began to get work as a model. On our drive from Hocking Hills to Akron, we stopped in Canton in order to check out the Pro Football Hall of Fame. 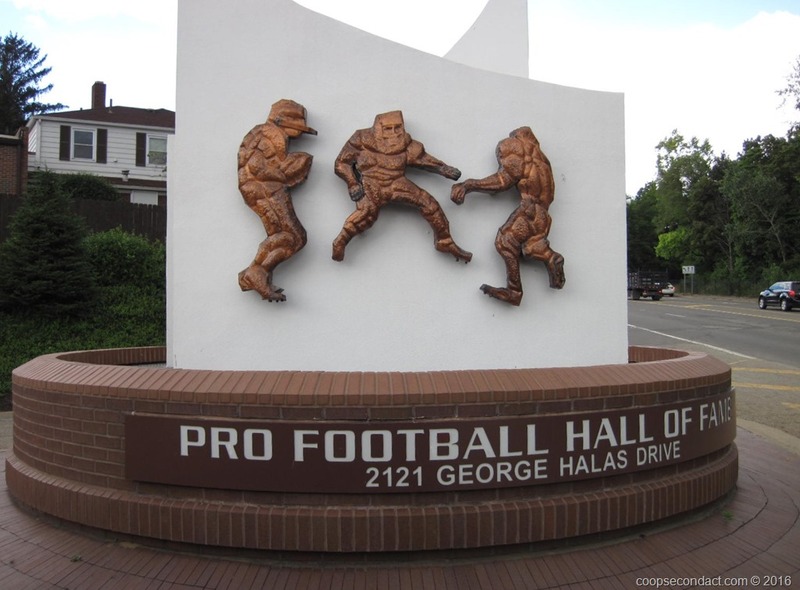 Like me, you may ask, why is the Pro Football Hall of Fame located in Canton, OH? The primary reason is that the American Professional Football Association, which later became the National Football League, was founded in Canton in 1920. In addition, the Canton Bulldogs were an early pro-football power team. If you’re a fan of professional football, it’s worth taking the time to visit.